Perfect Sound Forever: Indie cover bands- the Smiths, the Pixies, R.E.M. "I always tell people, ‘Some people play golf. I play in a band,’" Steve Kirsch says in the dingy break room of a rehearsal studio in the Philadelphia suburbs where his band, Lower Wolves, has just finished rehearsing. Kirsch is the drummer and one of the co-founders of the band, an R.E.M. tribute group. Well, that’s not quite right. They specifically bill themselves as an R.E.M. tribute band for the years 1981 - 1986, a range that avoids the band’s most recognizable hits, like "Losing My Religion," "Everybody Hurts," and "Man on the Moon." According to the band, the reason for limiting themselves to this era is that it’s R.E.M.’s indie period, but that’s also not quite right: Document, the band’s final album for I.R.S., was released in 1987. Really, it’s a lot simpler. "It’s just what we like," singer James Becker finally tells me. When I speak with the guys from Lower Wolves, they’re skeptical of my intentions. Music journalists rarely write about tribute acts, which are often regarded as novelties -- preferable to a jukebox, but only with the appropriate balance of alcohol and irony. Still, tribute bands are big business, especially for those that appeal to Baby Boomers. Bands like Dark Star Orchestra (The Grateful Dead), Echoes (Pink Floyd), Rain (The Beatles), and Dread Zeppelin (Led Zeppelin...as reggae), all regularly tour the country, playing sold out theaters in major markets. Considering the typical (advanced) age for a tribute band’s audience, I thought it seemed odd when I saw that Lower Wolves would be playing with tributes to two other titans of ‘80’s alternative rock -- Unloveable, a tribute to the Smiths/Morrissey, and Gigantic, a Pixies tribute. But the guys in Lower Wolves don’t find the lineup all that strange. After all, Lower Wolves alone have played with tributes to The Clash (The Magnificent Seven), Husker Dü (Re Dü), and The Minutemen (DnotD). As Kirsch tells me, "there’s a tribute band scene in every city." And although they might not yet be as financially viable as the more Boomer-centric acts, tribute bands that appeal to Generation-X are growing in number. Ed Hogarty, the band’s guitarist, laughs as he pieces it together. "I guess punk rockers are getting old." The truth is that Joe Ujj doesn’t understand tribute bands. He tells me about a New Hope, PA winery a few miles from his house that exclusively books tribute acts, with the most recent show being The World’s Best Fleetwood Mac Tribute. "The chick looks like Stevie Nicks with the top hat. And it just throws me off so much." As he recalls the ad, he seems to grow more confused. "I’d stare at them as people and think, ‘why do you do this?’" He pauses. "My wife and I think it’s for older people, in terms of demographic." Among people who fashion themselves serious music lovers, Ujj’s opinion is not all that unique. Cover bands are largely regarded as something to do once the creative fire has burnt out. Tribute acts who intentionally mimic a band’s identity only seem more ridiculous. Considering Ujj’s past, it’s no surprise that he’d have this opinion. For many who came of age in the burgeoning American indie rock scene of the 1980s, nostalgia and artifice were seen as cardinal sins. What is surprising, however, is that despite these feelings, Ujj currently fronts his own tribute band. But the members of Gigantic don’t see themselves in the same light as those classic-rock tribute acts. For them, they are simply paying homage to the music that was instrumental to their musical identities. "I think I learned how to sing from the Pixies. Especially those first two albums. I played those tapes to death," Ujj says. All of the members of Gigantic spent their 20’s seriously pursuing music. Ujj and drummer J.P. Wasicko spent years in Philly and New York, respectively, playing in numerous bands and flirting with record deals before burning out. Bassist and vocalist Christina Ward wandered through New Orleans and then Manhattan, sleeping in cars and camping in parks, forming groups and dealing with shady management along the way. Guitarist Anawim "Nawi" Avila toured with Philly jazz legend Odean Pope’s Saxophone Choir before starting his own projects, including a two-person "poetry rock" outfit and a 10-person marching band that gathered for rehearsals under the I-95 on-ramp in South Philly. In the past decade or so, Gigantic have settled into more conventional lives in the New Hope area, an arts colony on the Delaware River amidst the farmland of Bucks County: they’re parents working 9-5’s, who pay mortgages and apply for student loans. Alongside these responsibilities, the four of them are conscientious about carving out time for the band. When I sit in on a rehearsal in Ujj’s garage, a space that’s been converted into a recording studio lined with vintage guitars and stacks of back issues of Tape Op magazine, they play with serious purpose and attention to detail, repeatedly checking the clock to make sure they aren’t wasting any time. Still, real life cuts through sometimes. Avila has to skip out on the interview after rehearsal for parental responsibilities, so I call him a few weeks later to fill in missing details. I catch him on his evening commute, an hour and a half slog from Elizabeth, NJ, where he transcribes sheet music for wedding bands. Despite enduring the daily torture of New Jersey Turnpike traffic, he sounds at peace, explaining that he’s started listening to baseball on these drives to tune out the frustrations of the highway. "Baseball is just kind of beautiful," he says. "You can hear the atmospheric sounds, you can hear the air, you can feel the sighs of the stadium. The announcers are just so relaxing to listen to. They’re just so calm." Gigantic’s emphasis on technical precision, especially for the famously spastic songs of the Pixies, requires additional hours of solitary practice outside of the weekly group rehearsal. One might imagine that someone like Avila, who has three young children, would prefer to spend that precious free time relaxing, but he has been playing in bands for as long as he can remember. But music -- especially original music -- is a hard sell in the digital era. Despite the rise of access for listeners via streaming, royalties are miniscule for the overwhelming majority of recording artists. Playing live can be lucrative, but it’s difficult to attract a sizeable audience without the support of online buzz, which often favors younger voices. "I just feel compelled to do it. My parents were musicians. I’ve grown up with it ever since I was a baby," he tells me. "It’s just what I do, even if I don’t know why I’m doing it." Now as a parent himself, Avila keeps instruments around the house, encouraging his kids to play, but he’s weary of thrusting his younger ambitions on them. "It’s an honorable thing to do. I encourage my children to be as musically talented as they want to be... But it’s not super valued in society. People don’t want to pay for it. You know, the world is... " He trails off and then laughs. "I was gonna make some statement that I think I better not make." After I finally find the Huntingdon Valley, PA rehearsal studio where Unloveable practices, I ask the woman at the front desk for "The Smiths band." She directs me down a hallway plastered with fliers for other cover and tribute acts. Possum Kingdom, who play "all of the best 90s alternative," will be at a bar a few miles away the following weekend. Harassment, four middle-aged men whom I assume play Alice in Chains, or Puddle of Mudd, or both, stare down the camera as if they’re daring the photographer to laugh at their long jean shorts and cut-off Affliction t-shirts. 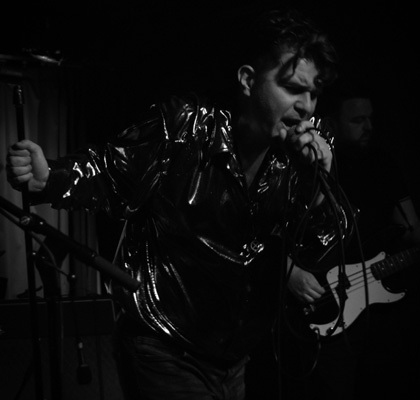 "We’re learning that this tribute band thing is kind of a scene," Jay Holowach, Unloveable’s front man and de-facto Morrissey, tells me later. Holowach began the group with a post on Craigslist because he thought it might be an interesting idea, but mostly because he missed being in a band. He’s played in countless groups of varying genres since his early teens, but spent the most time, a decade, as the bassist for the 18 member Bollywood-cover band Jersey Rhythms. Despite playing songs in a language he didn’t understand, he loved his time traveling across the country playing gigs. "It was like a family, but there was no fighting at all," he says, "which I suppose makes it less like a family." Despite only knowing one another for a few months, Unloveable interact like old friends during practice, teasing one another between songs for missed cues and flubbed lyrics. Within seconds of entering, I’m offered a beer to match the several they had already worked through. "I suppose we should finally play a song we know to convince you we actually know what we’re doing," Holowach says. After rehearsal, I follow the guys to Tin Pan Alley, a townie bar in the first floor of a house just a few minutes from their rehearsal space. We find a table in the corner while bassist Paul Greenhalgh orders a round and heads to the jukebox to load up some Smiths tracks. As we start to talk, the guys listen intently to one another as they tell stories from their pasts. Guitarist Gus Laserna recalls the first time he heard someone play the solo from "Let It Be" by plugging a guitar directly into his dad’s stereo. Drummer Sean Mitchell chuckles as tells a story about how he auditioned for a Nine Inch Nails tribute band but was so overcome with nerves that he was incapable of executing the elementary drum beat for "Closer." Holowach is still amazed that one measly Craigslist post was capable of bringing them all together. "Hand to God, there are sometimes at rehearsal where we do those songs and I’m so happy that I’m like almost to tears," he says. "I’m in a band where I’ve convinced three weirdos on Craigslist to help me play dress up. How did I pull this off?" Everyone laughs, but it’s clear he’s sincere. "I don’t know how you guys are, but at a certain point... male friendships? I’ve got to be working on a project with someone if I’m going to put aside the time to talk with you. That’s what I missed about being in a band. And now I can hang out with you guys, and it’s nice." The rest of the guys smile and nod, maybe realizing it themselves for the first time. Greenhalgh grabs everyone a few more beers and Laserna orders some fried appetizers for the table. I look at my watch and realize it’s almost midnight. The inimitable guitar sound from the Smiths’ "How Soon Is Now?" begins on the jukebox and the band cheers. A guy at the bar hears the mention of a Smiths tribute and makes his way over to talk about Morrissey. "How Soon is Now?" ends and The Grateful Dead’s "Touch of Grey" begins playing. "The only Dead song I’ve ever liked," Holowach says. "Come on now," the guy from the bar says, "You can put on a Dead show and slowly fall into a nap. It’s great." Somehow the conversation then twists and turns from the drum sound on Can’s Tago Mago, to the appropriate setting for listening to Rush, to extended theorizing on how someone might earnestly appreciate Dave Matthews. By the time I realize I should head home, I remember that I’ve left my phone recording on the table long after I finished interviewing the band. When I listen back the next day, it sounds like a handful of friends who have had a few drinks, arguing over mozzarella sticks about subjective taste as though it were empirical fact. It sounds familiar. In her academic study of the tribute band, Send in the Clones, cultural critic Georgina Gregory writes that "any entertainment capable of transporting us to our youth resonates with the cultural mood. By recapturing the look and sound of our collective past, the tribute offers a much needed refuge from temporal constraints." If that is indeed true, then Boot & Saddle, the small music venue in South Philly that’s the site of the Lower Wolves, Gigantic, and Unloveable show, is a fallout shelter. A concert featuring the original artists, after all, is impossible in the real world: both R.E.M. and the Smiths are long defunct and several years ago the Pixies began an embarrassing period that most fans would prefer to pretend does not exist. And even if all of these bands were still playing, they would not play together, they would not play in a 150-capacity room, they would not play the songs we all want to hear, and they would certainly not play for $12. The impossibility of the bill is clearly effective: even before Unloveable takes the stage the front bar of Boot & Saddle is growing crowded with couples who look like they’re thrilled to finally have the night off from the kids. Even if Gen-Xers defined themselves in opposition to the Boomers, it’s clear that they still want to revel in some good old fashioned nostalgia, even if just for a night. Unloveable takes the stage and rip into "Bigmouth Strikes Again." There’s a noticeable gap between the crowd and the stage, as if the audience is too hesitant, or maybe just too sober, to let loose. That doesn’t seem to bother the band. On stage, Holowach wears a flowing gold lamé jacket and periodically falls to the ground, writhing around melodramatically like his hero. By the time the band plays "Hand in Glove," three women move to the front of the crowd to dance and sing along. Holowach waves a bouquet of plastic roses at them and croons, "And if the people stare / then the people stare / Oh I really don’t know and I really don’t care." At the bar after the set, I ask a bald man in a Morrissey shirt what he thought. "I never got to see the Smiths," he says. "So this was just incredible." When the soundman cuts the music to signal the start of Gigantic’s set, Ujj doesn’t utter a word into the mic. Instead, he lets Wasicko kick into "Break My Body," a track from the Pixie’s seminal sophomore album, Surfer Rosa. Avila’s guitar screeches alongside Ujj and Ward’s harmonies. A guy next to me screams along with every word and when it’s over, he leans into my ear. "I can’t tell you how many times I’ve listened to that album," he says. For the next song, Avila begins changing the tuning on his guitar, but grows self-conscious when he realizes how much time it’s talking. "Banter, banter, banter," he tells Joe, who steps to the mic. "This will show my age, but I played here back in ‘96," he says. "Woo! Age!" someone yells from the crowd. It sounds sincere. The crowd laughs in response, happy that everyone seems to be on the same page. The rest of the set finds them barrelling through many of the most frenetic Pixies songs with an ease that’s clearly the result of their focused study. At the end of every song, the crowd grows louder, especially when they hear the unmistakable intro for fan favorite "Hey." "They nailed that," my new friend says, starstruck. "This is unreal." The band closes with "Isla De Encanta" but the audience demands another one. Ujj turns to the other members, unsure of the protocol. Is this acceptable for the middle act? Does this happen at tribute shows? They effectively shrug, decide to play "I’m Amazed," and somehow still leave the crowd wanting more. By the start of Lower Wolves’ set, the venue has filled to capacity. When Hogarty plays the opening notes of "Begin the Begin," the first track from 1986’s Life’s Rich Pageant, the room erupts in a chorus of whoops and yelps. Becker wears a tightly buttoned blazer and gestures every syllable emphatically. He stares out over the crowd, at no one in particular, looking a bit crazed as he recites the band’s often abstract and sometimes downright nonsensical lyrics. His voice sounds distinctly different from Michael Stipe’s, but it’s clear that he’s not concerned with pitch-perfect mimicry. Instead, he acts as conductor, waving his arms as he leads the crowd’s singalong. They hang on every chord change, dancing as they carelessly wave their drinks and sing into their friends’ ears. Kirsch repeatedly told me that they’re singularly focused on recreating the attitude and the energy of early R.E.M. shows, and they’re wildly successful: if anything, this night, in this sweaty room, is a lot closer to seeing R.E.M. in the early ‘80’s than it would be if the original members of R.E.M. were still playing together today. After a while, it’s easy to forget that we’re all in 2018 and not 1983. Every three minutes or so, I see someone in front of me cheer in amazed recognition that they were hearing this song in person, forgetting, or maybe just not caring, that it wasn’t being played by the original members. And, really, in the moment that detail seems largely unimportant. After all, the only thing that’s changed is what the people in attendance -- on and off stage -- look like. But who can be bothered to think about that right now? I mean, come on: they’re playing "Radio Free Europe."